Now you can proudly display your Viking heritage even on formal occasions with these beautiful Viking cufflinks. 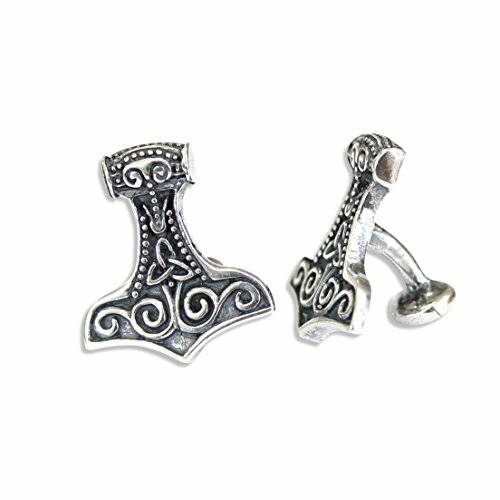 Cast in solid white bronze with an oxidized double silver plated finish to enhance the intricate details that embodies the rich mythology of the legendary hammer of Thor. Each hammer measures 7/8" long and is cast in one solid piece of metal just like they made them in the old days, no solder joints or flimsy hinge pins to fail. No effort was spared in the making of this future family heirloom that you can pass down to your grand kids. The Viking god Thor owned a short-handled hammer, which, when thrown at a target, returned magically to its owner. His hammer also had the power to throw lightning bolts. To wield his hammer, Thor wore the a magical belt, which boosted the wearer's strength and a pair of special iron gloves, to lift the hammer. The hammer was also his main weapon when fighting giants. The uniquely shaped symbol subsequently became a very popular ornament during the Viking Age and has since become an iconic symbol of Germanic paganism. If you have any questions about this product by Moon Raven Designs, contact us by completing and submitting the form below. If you are looking for a specif part number, please include it with your message.